Dr Zwart is a Montgomery native where he was raised on a Dairy Farm. He graduated from Valley Central High School. He then went on to Messiah College for his undergraduate work, after which, he attended National College of Chiropractor near Chicago. He received awards for Excellence in Anatomical Cavaderic Dissection and Excellence in Chiropractic research. Dr Zwart has his BS in Human Biology as well as his Doctor of Chiropractic degree. Following graduation in 1989, he returned to the Hudson Valley, where he practiced in Ellenville for 6 years. In June 1995, he opened his Pine Bush office. 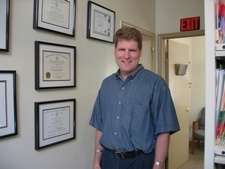 Dr Zwart earned his CCSP (Certified Chiropractic Sports Practioner) in 1997 and is also Certified in McKenzie Technique. He has also accumulated over 250 hours of studies in Low Tech Chiropractic Spinal Rehab over the past few years. He continues to follow trends and scientific developments to further his education. He lives locally with his wife Linda, who is a registered and practicing architect in New York. They have two children Sarah and Paul. Their family enjoys athletics, playing his sax, ATVs and hiking. Dr Zwart is also an accomplished fine woodworker. They attend Leptondale Bible Church where they are actively involved.